Ensure users adhere to company policy regarding Internet access. Inspect the traffic and block potential malware and suspicious activities. Make end users aware their Web traffic is inspected. As you can see, Forefront TMG uses three main cloud components: Microsoft Update, Telemetry Service and Microsoft Reputation Service (MRS). Microsoft Update keeps anti-malware and Network Inspection System (NIS) signatures updated. The Microsoft malware response team uses telemetry reports provided by TMG to learn what attacks are being seen and thus enhance signature quality. MRS maintains a huge database of categorized URLs that Forefront TMG 2010 can query. In this article we’ll focus on URL filtering and HTTPS inspection. We covered malware inspection in-depth in our previous TechNet Magazine February 2009 article, and the feature hasn’t changed in Forefront TMG 2010. URL filtering can be viewed as the Forefront TMG first line of defense for helping to secure your organization’s Web access. By using URL filtering to block requests for undesirable Web sites, Forefront TMG can spend less time scanning for malware and more time delivering useful content. The Web application sends a request for “http://malware.contoso.com/nefarious” through TMG. The Web proxy filter passes the request through URL filtering. URL filtering looks for each part into the local URL category cache. Note: if the request cannot be matched to a URL category within the local cache, URL filtering queries MRS. If MRS returns “unknown,” or if MRS can’t be contacted, URL filtering returns an “unknown” response to the Web proxy filter. Malware.contoso.com/nefarious = Unknown In this example, two categories are identified: General Business and Malicious. Based on the predefined precedence list, Malicious takes precedence over General Business; as a result, the whole URL will be designated as Malicious. 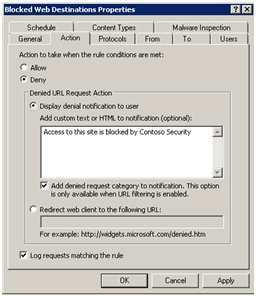 If the resulting URL category set matches a deny rule, the request is rejected and an error response is returned to the Web application. If the URL category doesn’t match a deny rule and does match an allow rule, the request is served according to the matching rule’s remaining criteria. If the request fails to match any user-created deny or allow rule, TMG rule processing falls through to the default deny rule and returns a rejection response to the Web application. Because users tend to be statistically habitual in their Web usage, the URL category cache will become more relevant to your organization over time as Forefront TMG processes user requests. In this way, the ratio of MRS queries to user requests will eventually decrease. Because URL categories are likely to change, MRS assigns a time-to-live for each entry. As such, the number of MRS requests will never completely reach zero, even if your users always go to the same sites. To fully understand how URL filtering works, you have to also understand how Web applications create connections and issue requests. Web applications generally fall into two categories: those that are configured to act as Web proxy clients, and those that aren’t. In this case, Forefront TMG, and thus URL filtering, has the complete URL available for comparison with the URL filtering database. Note: METHOD may be any valid HTTP method, such as GET, POST and so forth. For these requests, Forefront TMG and URL filtering have only the hostname or IP address (depending on how the client issues the request) and port for comparison with the URL filtering database. Is the connection directed to the default HTTP port? If so, the Web proxy may be able to intercept this request and pass it to URL filtering for comparison. If not, the request will not be seen by URL filtering and thus cannot be compared to the database. If the connection is directed at the default HTTPS port, is HTTPS inspection enabled? If so, HTTPS inspection can bridge the connection, and URL filtering will have an opportunity to compare the request to the database. What may not seem obvious is that URL filtering in and of itself does not provide any form of blocking mechanism—it merely responds to the Web proxy with the categories associated with the requested URL as the Web proxy (and thus URL filtering) understands it. In all cases, when URL filtering receives a client request, it functions as illustrated in Figure 2. If Forefront TMG needs to query MRS, a request is made using a single Web Services call to the MRS Web services portal. MRS processes the data presented by Forefront TMG and responds with the current URL categories that apply to the data MRS received. Forefront TMG 2010 has a predefined domain set that includes the portal destinations in effect when Forefront TMG shipped (see Figure 3). If the URL categories returned by URL filtering are found in a “deny” rule, Forefront TMG sends a rejection response (HTTP result-code 502) to the client. Depending on whether the client is a browser or other Web application, the user may see the Forefront TMG response page; in the case of a non-browser application (such as Windows Media Player or a CERN-proxy FTP application), the user may simply see an error message from the application itself. Because the most expensive task Forefront TMG has to perform in order to determine the URL category is to query MRS, this process is much cheaper in terms of CPU, memory and network resources than allowing the user to reach the Web site, then having to perform malware scanning on all of the content they request. Users have been advised for many years that to perform a secure online transaction, they have to use HTTP with SSL (HTTPS). However, this secure channel has also been used for malicious purposes. When users start a transaction using HTTPS, this traffic is normally encrypted end-to-end (from user to destination server), making the content being exchanged between them unreadable to any device in between. While this is a desirable behavior, because you don’t want anybody looking at your online credit-card transaction, the drawback is that any malicious operation within this channel can’t be evaluated. Figure 4 highlights the main parts of this operation using ISA Server 2006 as the firewall. Client connects to the Web proxy. Client issues an SSL tunnel request: CONNECT malicious.contoso.com:443 HTTP/1.1. Web proxy resolves malicious.contoso.com to IP address 1.2.3.4. Web proxy connects to 1.2.3.4 on TCP port 443. Web proxy sends “200 OK” to the client. Client and Web server exchange SSL handshake messages, encryption keys and certificates. Client now has an encrypted tunnel end-to-end with the destination server and it will start send-and-receive traffic through this tunnel. ISA Server will keep that tunnel open between client and server but it will not inspect the traffic because it doesn’t have this capability. The potential risk in this scenario is that as of phase 2, the edge firewall has no knowledge of what really is being transmitted on that channel. In a scenario where the destination server is hijacked and malicious code inserted, there’s a potential risk that the destination server will send malware through this encrypted channel that the client will receive without hesitation because it comes through a supposedly trusted connection. Forefront TMG HTTPS Inspection reduces this threat by inspecting the traffic and maintaining separate encrypted channels with the user and server. Figure 5 shows how Forefront TMG accomplishes that. Client connects to the TMG Web proxy listener. TMG resolves malicious.contoso.com to IP address 1.2.3.4. TMG connects to 1.2.3.4 on TCP port 443. TMG negotiates an SSL connection with the server and evaluates the certificate. If the certificate is valid and trusted, TMG responds “200 OK” to the client. Client and TMG exchange SSL handshake messages, encryption keys and certificates. Note that because TMG builds a server certificate using information derived from the Web server certificate, the client believes it is communicating with the Web server. a) TMG receives and decrypts the encrypted traffic from the destination server. b) TMG applies Malware Inspection and NIS filters to the traffic. c) If the malware and NIS filters allow, TMG will encrypt the results and send it to the client workstation. d) Client will receive, decrypt and process the traffic. To establish the SSL handshake with the client, Forefront TMG needs a server certificate. In order to create it, Forefront TMG creates a spoof certificate based on the original server certificate data and signs it with the HTTPS inspection CA certificate. To ensure maximum performance, Forefront TMG maintains a cache of duplicate server certificates. TMG will search for a duplicate server certificate in the local cache and if one is not found, it will duplicate the upstream server certificate and place it in the cache. The cache is stored only in memory. Thus, the spoof certificate cache is empty after the Firewall service is restarted. Note: The size of cache (number of certificates) is controlled by the LowLevelSettings.ClonedCertificatesCacheSize COM property. Before configuring HTTPS inspection, it is important to understand the full feature set and options that comprise this feature. Figure 6 shows the areas where HTTPS Inspection can be configured. When planning your HTTPS inspection implementation, you need to first consider the certificate settings, to decide whether you will use a self-signed certificate or a certificate issued by an internal CA. When importing an existing trusted certificate authority, you need a PFX file that contains the certificate of the authority along with its private key. You need this private key in order to sign the spoof certificate issued by TMG. You must also make sure the certificate’s key usage is set for certificate signing. 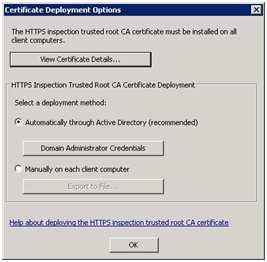 This CA certificate must then be deployed on the client computers (under “Trusted Root Certification Authorities” of the local computer certificates store); otherwise, the client won’t trust the server certificate received from TMG. From the Forefront TMG console, click Web Access Policy and select Configure HTTPS Inspection under Web Protection Task on the Tasks pane. On the General tab of the HTTPS Outbound Inspection screen, select the Enable HTTPS inspection checkbox as shown in Figure 7. For this example, we’ll use a Forefront TMG self-signed certificate. Click Generate and a page similar to the one in Figure 8 will appear. On the Generate Certificate page, fill in the issuer name, expiration date and the Issuer statement according to your company needs, then click Generate Certificate Now. A new certificate will be generated and the Certificate page pops up. 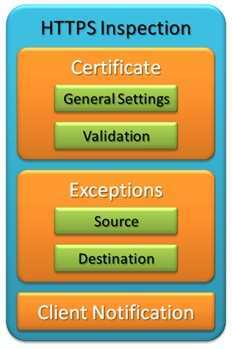 Verify the certificate configuration and click Close. 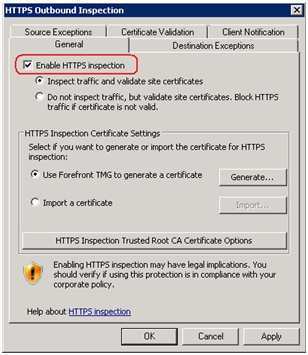 On the HTTPS Outbound Inspection window, click HTTPS Inspection Trusted Root CA Certificate Options button. The Certificate Deployment Options window appears as shown in Figure 9. If TMG belongs to a domain, the recommended deployment method is “Automatically through Active Directory.” When you choose this option, the TMG CA certificate will be automatically deployed to the client computers using Group Policy. Click the Domain Administrator Credentials button and type the credentials that will be used for this operation. Click OK. Note that you should not include the domain in the user name field. Because Forefront TMG uses the certutil tool to publish the TMG CA certificate to Active Directory, you may notice a brief command prompt window. Click OK on the “Automatic certificate deployment succeeded” message box and OK on the Certificate Deployment Options window. Important: Besides satisfying your organization’s security policies, you also need to evaluate any legal and compliance regulations before you enable HTTPS inspection. Any sites where HTTPS inspection is deemed inappropriate can be added to the exception list. HTTPS inspection and URL filtering in Forefront TMG not only help provide a protected surfing environment for end users, they also include features that enhance the end-user experience through informational messages and by providing custom or precise error messages the end user can directly relate to. To remain in compliance with corporate privacy policies, you can turn on client-side notification, which alerts the end user when an SSL site is being inspected and gives him the option to leave the site in order to protect information he deems personal or classified. Figure 10 illustrates this behavior. 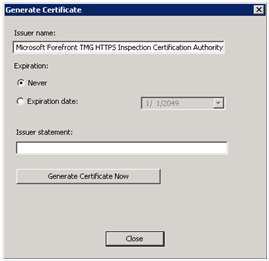 For the user to receive HTTPS inspection notification, the client computer must have Forefront TMG Client installed, and it must have the HTTPS inspection trusted root certification authority installed in the local computer Trusted Root Certification Authorities certificate store. Remember that if you have upstream and downstream TMG configuration, HTTPS notifications need to be enabled on the downstream proxy rather than the upstream proxy. In the Forefront TMG Management console, click Web Access Policy. Under Tasks in the right pane, click Configure HTTPS Inspection. On the Client Notification tab, click Notify users that HTTPS content is being inspected, and then click OK.
Right-click on the Forefront TMG Client icon in the system tray and click Configure. On the Secure Connection Inspection tab, select Notify me when content sent to secure Web sites is inspected and click OK.
An administrator can allow or deny Web access to end users based on URL categories. If a user tries to go to a site that has been denied, she will get an error page like the one in Figure 11, showing that access to the site was denied because it had been categorized as such by the Forefront TMG administrator. Open Forefront TMG management console and click Web Access Policy. Double-click to open the rule created by the administrator to allow or deny access. Click on Action tab as shown in Figure 12. You can add any custom message to the Display denial notification to user text box. You can even use HTML content as long as the HTML is valid within the context of an HTML <body> element, but you can’t include any scripts. You can also choose to show the category under which access to the site was denied. To do so, click the checkbox for Add denied request category to notification. This is particularly useful if a site is categorized incorrectly so the end user can let you know. You, in turn, can send this feedback to Microsoft through telemetry and at the same time set up an override category to rectify the categorization till it is fixed. If you’d like to change the look and feel of the entire URL filtering error message page, you’ll need to edit the 12232.htm HTML page. You’ll find information about this on the Deny Page Customization on Forefront TMG 2010 page of the Forefront TMG (ISA Server) Product Team Blog. **Mohit Saxena ****is the technical lead for the Microsoft ISA Server Support Team, a group of Support and Escalation engineers that works with customers on break fix issues, bugs and design change requests.